Trying to predict short term direction is notoriously difficult, especially in the volatile metals market, but I'm going to take a stab at it today. First off let me start with the big picture: For almost a year now I've been saying that the inflation that's been stored in the stock market for the last three years is eventually going to start leaking into the commodity markets. 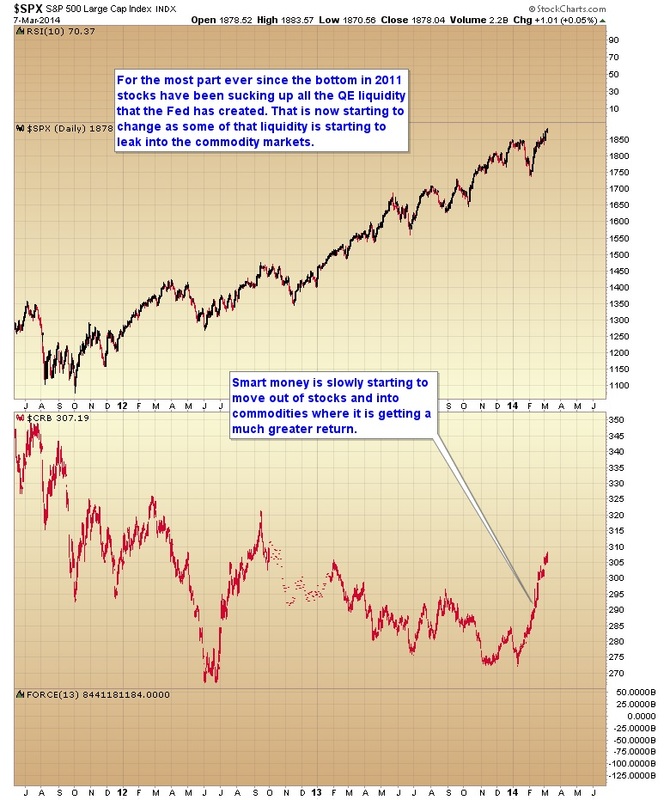 You can see in the next chart that process has begun as smart money investors begin to move capital out of an overvalued and overextended stock market that is destined to top some time during the first half of this year, and into undervalued commodity markets where they are getting a better return on their investment. While the stock market is up 10% over the last month and a half, the CRB is up 12%. But that's not the whole story. Gold is up 14% in the last two months, oil 15%, wheat 20%, corn 23%, sugar 27%, and the big winners, coffee at 90%, and natural gas at one point over 100%. These kind of gains are going to draw more and more capital away from the stock market, at least until commodities form an intermediate top (probably around the first or second week of April). Yes this kind of explosive rally is going to have some kind of corrective move later this spring, but I don't think the rally is done just yet. 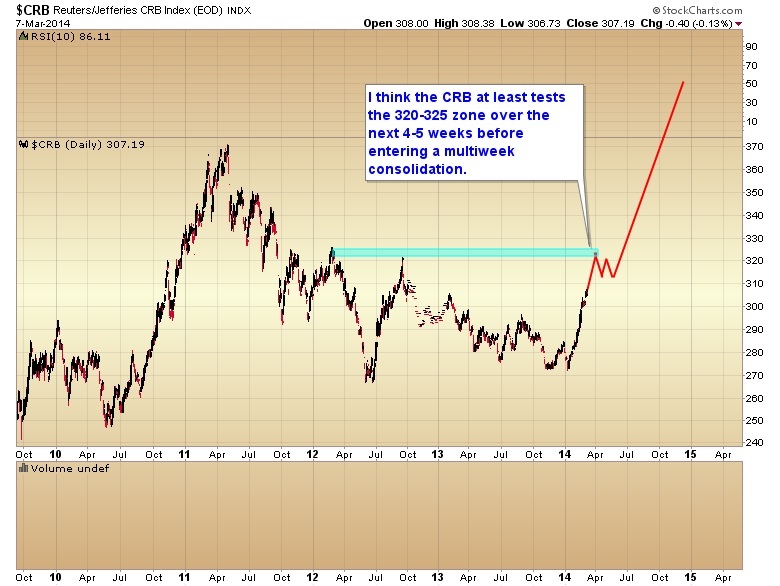 I'm looking for an acceleration of the move in March to at least test the 2012 high at 320 on the CRB index before commodities enter a multi-week correction/consolidation phase in April and May. Next week has the potential to begin this acceleration phase if a couple of things fall into place. First off I think we need to see the dollar continue down into its next daily cycle low, potentially on the March 19 FOMC meeting. I've also taken the liberty of extrapolating on the chart my expectations for the dollar index over the next month as it moves into an intermediate degree bottom. If I'm right about the next week and a half, then I'm looking for the dollar to drop down and test the October low between now and March 19. As that level is a major support zone I think we will probably get a strong enough bounce at that point to produce a daily cycle low. However, considering that this intermediate cycle topped on week two I don't think this intermediate decline will be done until the dollar breaks below that October bottom, producing a failed intermediate cycle. So I'm going to look for a shortened daily cycle during the second half of March with a final intermediate bottom probably on the April jobs report. With the January and February employment reports coming in very weak, and the March report respectable at 175,000, I think the market is going to want to see confirmation from the April report before the intermediate trend in the dollar reverses. 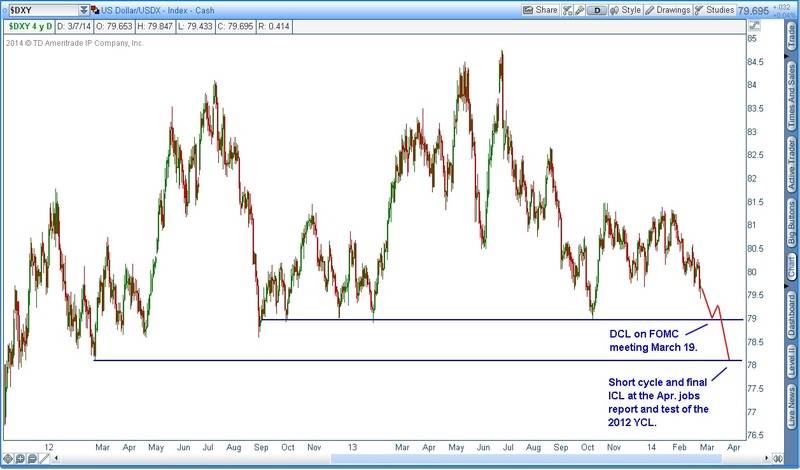 Make no mistake, currencies are what is driving the commodity markets, not demand, and I don't expect them to top until the dollar index finds its intermediate bottom.